Smooth. Silent. Small and elegant. A (r)Evolutionary new way to see bike riding in your life. EcoSpeed was built for everyone. From 6 to 106, no matter what your riding style might be, Ecospeed was designed with you in mind. Upright, longtail, cargo, recumbent, off road, we are here for you. Commuting to work, EcoSpeed will take out the stress and help you enjoy the ride arriving refreshed and ready for the day. Looking at giving up the second car or even the first, and a cargo bike is calling your name. Our system will seal the deal. Getting around town, picking up groceries or kids in a breeze. You can rest assured that you will be able to go anywhere, do anything using your beautiful new cargo bike and lets face it, you will be the envy of all your friends and neighbors as you cruise on down the road. Needing to find a way to help you get back on a bike and start getting healthy, then our system will give you the confidence of knowing that you can. The first time you put your thumb on the throttle and start to pedal you will be filled with the joy of riding again and the world is your oyster. We believe we are the future of bike riding in the world. We believe that bike riding is for everyone. We believe that it’s time to start thinking about how all of us are going to be getting around in the future. Why not start today and be ahead of the game. Hundreds of riders have experienced the joy and reliability of our systems and we want to offer this opportunity to you. EcoSpeed revolutionizes the way the world thinks about transportation. We build one of the best electric assist mid drive systems in the world, and we’ve been doing it for over 10 years. Our systems can make your daily commute a breeze, or give you the opportunity to once again feel the joy of riding your bike after years of believing those days were gone forever. One of the true beauties of our system is, we can fit your bike, allowing you to create the best ride for your needs. Want a new bike in the future? Just transfer you motor system over and away you go! This can come in handy if you want to change from a regular bike to a long-tail bike that can carry your children our your children’s children. The passion that we feel for our company cannot be quenched. We are dedicated to appropriate technology and human friendly transportation, striving to create a bike for conscious travelers, which provides the convenience and reliability of a car, without the ecological footprint. The EcoSpeed kits epitomize human-scale transportation that is healthy; personally, socially, and environmentally. Our vision: to provide viable human scale transportation options that empower individuals and society with the highest performing electric bikes possible. Every day, all across America and the world, people are waking up and riding their EcoSpeed to work. Up hills, around town, and through city streets. Our System fits your bike, making it your best ride ever. 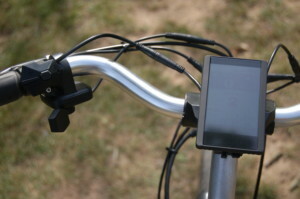 The extra speed that EcoSpeed offers, allows them to have confidence in using their bike to navigate the daily commute. The stress of riding to work tired and sweaty, has become a thing of the past. Some people like three wheels for added stability and comfort. Since the creation of the bicycle, society has been using bikes to haul not only passengers, but also cargo to and fro. As our world begins to look at ways to care for the planet cargo bikes are retuning to the streets by the thousands as one of the fastest growing markets in the bike industry. Families are using them for local commuting. Taking the kids to and from school, picking up the groceries, or getting the dog to the vet can all be done from your favorite cargo bike. The smiles that you see are not only on the families riding but also on everyone they pass. Innovative businesses are using Cargo Bikes as a smart economical replacement to a cargo van for nimble delivery in and around city streets. EcoSpeed can take the basic cargo bike and turn it into a cargo truck, capable of hauling twice as much as before. It truly is the ultimate in car replacement therapy, extremely practical and freeing to the spirit. Check out just some of our customers and their cool cargo bikes and how they use EcoSpeed for their business. Imagine the possibilities in your world. 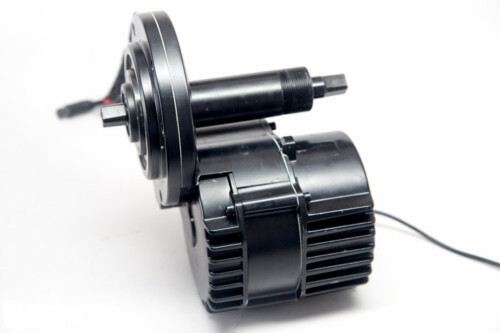 Custom color on Motor and Crank set was just one special feature for Purple Mountain Organics. Riders over 50 love the reliability of an EcoSpeed kit. Hills that were once daunting and off limits become a breeze, and those one and two mile rides turn into 10 and 20 mile rides. Riders who believed that bike riding was a thing of the past are back on the road again getting active, staying healthy living a greener lifestyle and showing everyone that life really is better from the seat of a bike. Making dreams come true is one of our greatest missions here at EcoSpeed and something we are all proud to be a part of. Helping riders find the perfect system that can fit their bike makes our day. Our experience over the years customizing kits for recumbent bikes, has given us the upper hand in modifying and electrifying a variety of pedal machines and turns them into viable transportation for people that otherwise would not be able to ride. Some of our adaptive riders rock the mileage and get more miles in than our most epic commuters. Exercising and being active, using your riding time as physical therapy is a great perk, but finding your individuality and freedom again is priceless. Our riders have been able to once again enter the world on their terms. Free to come and go when they choose. Terry is able to ride 12 to 18 miles a day, knowing that he has the security and added assist of his EcoSpeed motor. He says his legs have fended off Parkinsons more than any other part of his body, and the doctors are amazed at the miles he rides on his Greenspeed Tadpole Trike. Not just for city streets, EcoSpeed can even be added to your favorite off road bike. Leave the other riders in the dust as you zip up and around the trails and through the woods. Discover the back trails and fire roads of America on your bike. To awaken, not only Portlanders to the EcoSpeed systems, but the entire biking community around the world. As a small, homegrown Portland business, we don’t have a deep investor pool or qualify for traditional loans. So,our goal is to make a run of 50 complete kits. We here at EcoSpeed have dedicated ourselves to our mission because we believe in human scale transportation that is healthy not only for the people using it personally and socially, but also healthy for the community and for the planet. We want to be able to offer our systems in bike shops around the world and we are hoping, with your help and support, that EcoSpeed will finally be able to offer our systems to riders everywhere instead of just custom orders. Hundreds of riders have experienced the joy and reliability of our systems and we want to offer this opportunity to you. With your help, our Kickstarter will enable us to go from building one system at a time, to a true production line.We want to start with 50 systems and build up from there.Our goal: to have our systems in bike shops around the world so riders can experience the joy and reliability of EcoSpeed. We know that once you ride with our system, you’ll wonder how you ever got along without it. This is our story. Great success stories always seem to start in a garage or basement, Amazon, Apple, Disney just to mention a few, and EcoSpeed is no different. Developer/Designer/Engineer, Brent Bolton, was searching for an electric conversion for his Bike E recumbent in 2003. With a dream, skill and knowledge he created the first system. It worked so well, he decided he would continue to produce and EcoSpeed was born in his basement. 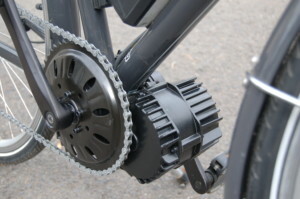 Brent custom designed and developed over 25 different kits for recumbents and in the process, coined the term “mid-drive” which has become an industry standard term for electric assist that utilizes the gears of a bike. With the amazing success in our high performing kits for recumbents we were ready for the next stage; mid-drives for upright bikes and tadpole trikes. Tapping into the drive train, using a custom freewheeling crank set they have become our most popular product in the past five years. Our premiere electric assist systems are fully developed and tested and ready for your next ride. The EcoSpeed system is like no other in high power and performance, with the ability to be adapted easily to the right bike for your needs. 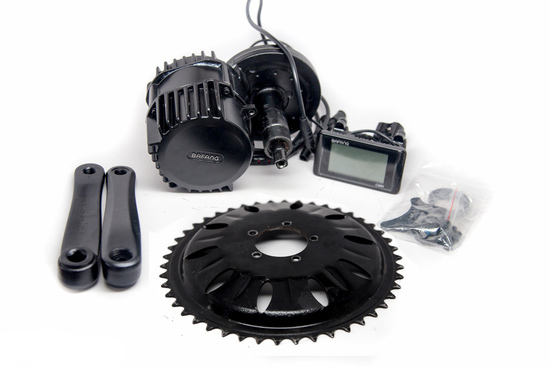 What is an EcoSpeed Mid-Drive System? 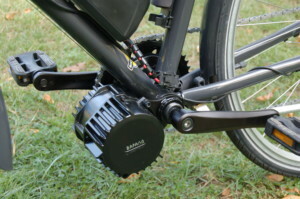 It is an add-on-mid-drive kit that turns your favorite bike into an electric bike. 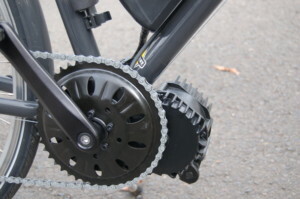 It’s unique in that the kit interfaces with the bikes drive train and the motor power goes through whichever gear the rider is using. As you start out in a lower gear your cadence picks up as you gain speed, and then its time to change up to the next highest gear… just like a car engine. The cool thing is that as your pedaling cadence gets high, the motor is winding out too…its always right their with you. You are still pedaling and getting exercise, but you are riding faster, going further, and climbing higher for the energy your putting out… not to mention having the ability to haul loads as if they were as light as a feather. 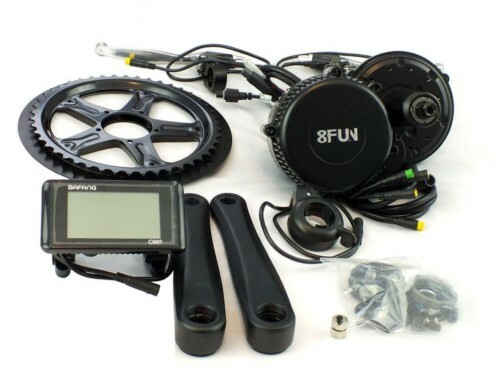 Each of our Kits Include: 1300 watt motor system, our velociraptor motor controller, our freewheeling triple crankset built around a White Industries freewheel, custom Phil Wood bottom bracket, thumb throttle, and all the necessary framework and bracketing to integrate our system to your bike. Visit our website for accessories like a digital display showing speed and power, integrated lighting, etc. 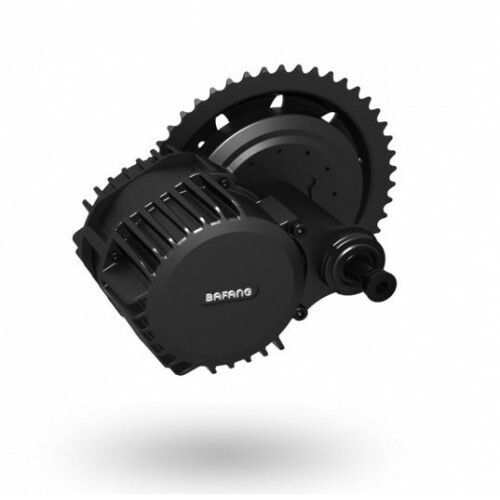 Pick Your Accent Color – motor frame – crankset – controller bracket . Example photo shows red. A great titanium drop bar bike for fast urban utility from legendary Portland Company, Ti-Cycles. Built up with disc breaks and choice components for the long haul. Let us know if you have any special build requests, as we will be assembling these frames into bikes right here in our shop. 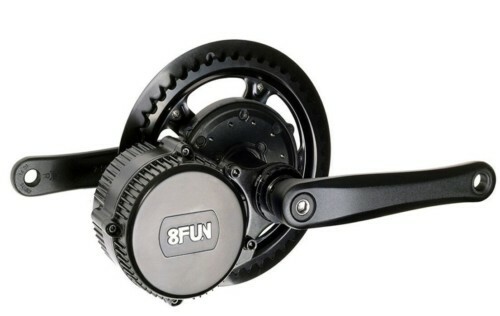 A fast, performance ride capeable of touring or jetting across town. This trike blends form and function. A long wheel base Sport-Luxury Catrike. Capable of handling heavy loads for long distance touring. Stunning looks, smooth and stable ride, this bike will replace your car. This stable, intuitive and easy to ride long wheelbase recumbent is a joy to ride. This made in Oregon velomobile can get you places, efficient, warm, and dry. This velo has everything you need for running errands, the daily commute, and a weekend joyride. The revolution is on, come and ride with us into the future. Our systems are not prototypes, we have made many of them and the only thing that has held us back has been the constraint of having to make them one at a time, with high cost and low volume. Today we come to you with our creations and dreams. If our production is delayed you will know about it, but rest assured that we will not let your order go unfilled. We will not quit until our orders are fulfilled. With over ten years experience developing and making our mid-drive assists, we have stuck with it even before there was a market for E-bikes. We’ve done this because each kit that goes out has a positive affect in the life of the person who rides it. We are in business for you, and for our shared future.